Shannon Z. Bacon, CPA is owner and founder of QOL Accounting and Tax Services, LLC. She specializes in helping small businesses and large businesses with a wide range of tax, consulting, and accounting issues. Shannon received her Master’s of Accountancy with concentration in Tax from Kennesaw State University in 2001. She also holds a Bachelor's of Business Administration with a major in Accounting from Georgia State University in 1999. She is a licensed Certified Public Accountant in the state of Georgia. She enjoys spending time with her family, reading books, and exercising with friends. Her passion is equipping young people with the knowledge to be financially independent and to achieve their dreams. She has always had a passion for helping kids achieve their life goals and dreams. 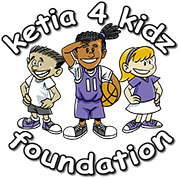 I love the Ketia4Kidz Foundation’s mission of supporting military kids. I have never been a military child but hearing Ketia’s story of growing up as a military kid and going through deployments with her parents really touched my heart. It also brought to mind military kids who I crossed path with in the past, either classmates, family members, or friends. I love being part of an organization that recognizes the unique struggle of these children and are providing scholarships and services to help make it easier for these kids to achieve their dreams.